“My fundamental belief is that we are all the same as human beings. We don’t need an introduction when we meet because we are mentally, physically, emotionally the same. I find this is a very helpful way of thinking. 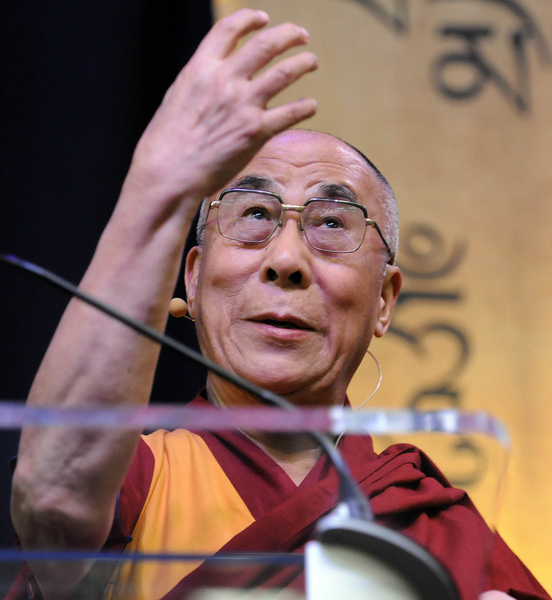 Whether I’m speaking to 1000 people or 100,000, there are no barriers between us.” The Dalai Lama. 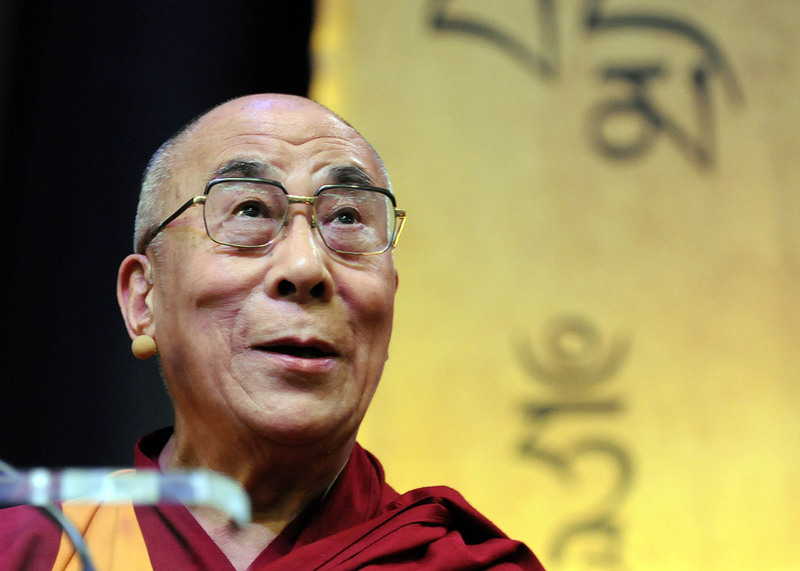 Winner of the Nobel Peace Prize in 1989, the Dalai Lama’s teachings on compassion, religious tolerance and peace serve as a beacon of hope in our chaotic, combative world. 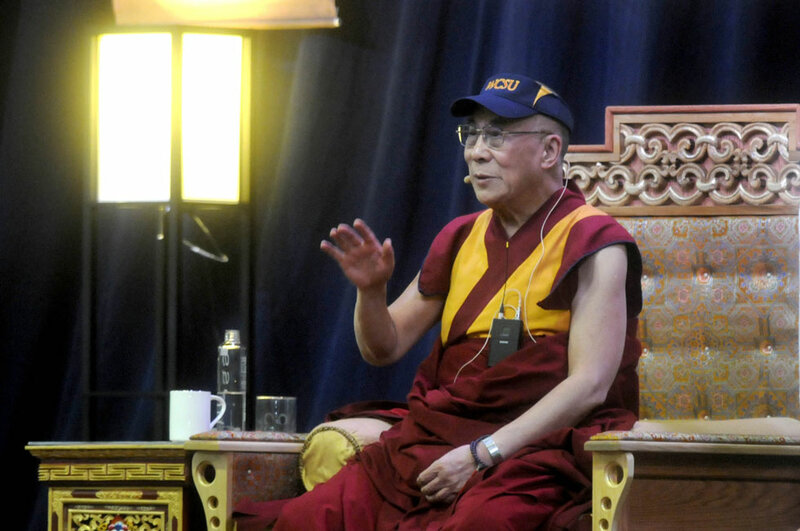 The 77-year-old Buddhist monk has lived in exile in India since 1959 after fleeing China’s military occupation of Tibet. 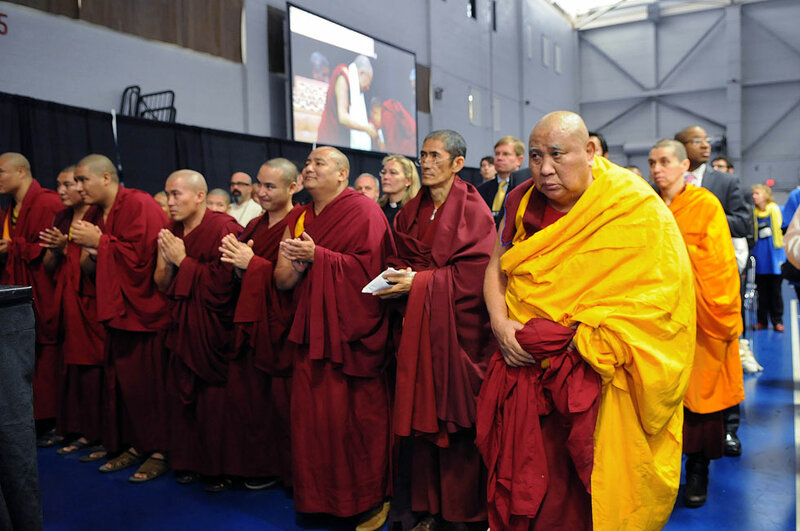 The Tibetan spiritual and temporal leader travels the globe promoting a range of human values such as compassion, forgiveness, tolerance, contentment and self-discipline. 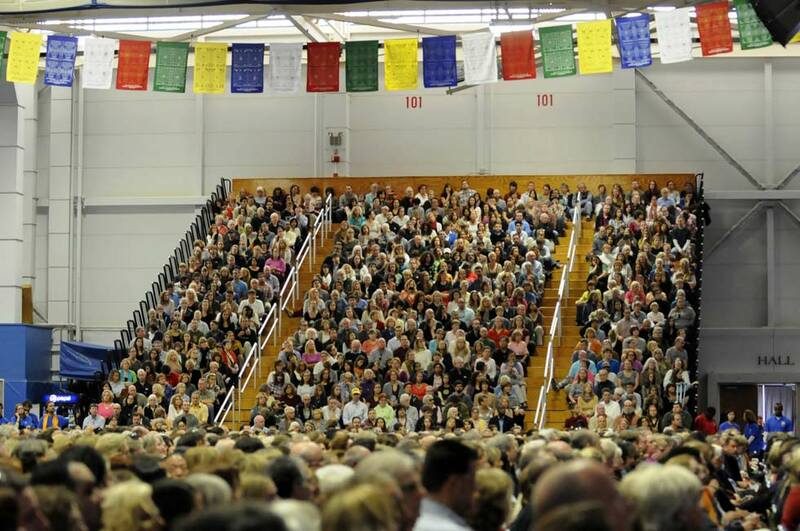 Reporter Kathy Megan and I were assigned to cover the first of two talks His Holiness gave at the school. After applying for credentials, we were emailed detailed instructions about parking, time of arrival, restrictions on food and drink and general protocol. When we arrived, we were subjected to a security screening that rivaled a presidential visit, with an arrival deadline a full four hours prior to the speech and a sweep of our equipment by a Ct. state police bomb-sniffing dog prior to entering the arena. Once inside, the media were corralled into an area in a corner of the arena far from the stage. There was no riser, as is normally provided for such events, so we were forced to shoot from floor level, frequently blocked by latecomers heading to their seats. 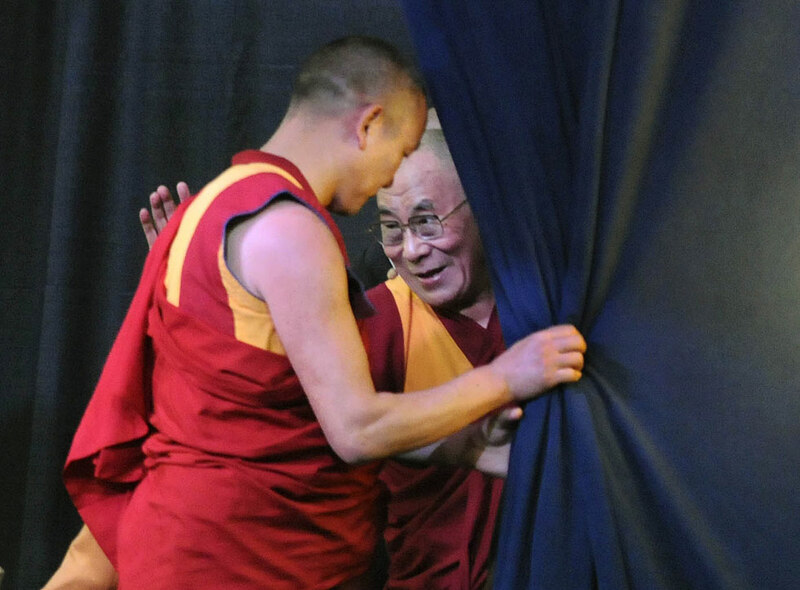 After a few minutes of chanting by a group of Buddhist monks, the Dalai Lama – which means “Ocean of Wisdom” – emerged from a curtain behind the stage draped in crimson and saffron-colored robes, and took a seat in a large throne-like chair in the center of the stage. 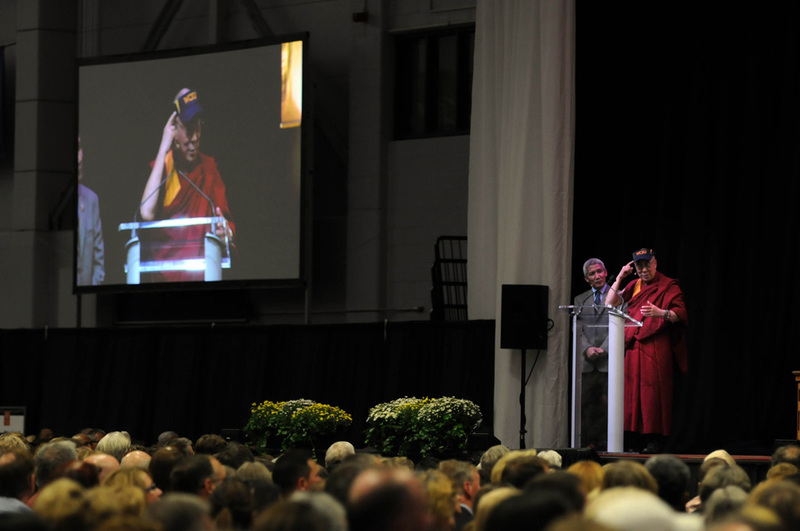 After welcoming remarks from WCSU president James Schmotter, and an introduction by actor Richard Gere, a long-time disciple, the Dalai Lama began his talk at a plexi-glass podium – sporting a WCSU visor – with his interpreter by his side. The still photographers and videographers were split into two groups, and escorted in turn up to the stage for one minute – yes, only one minute! – at the start of the Dalai Lama’s talk to get some close-ups. Then we were returned to the “corral” for the duration. 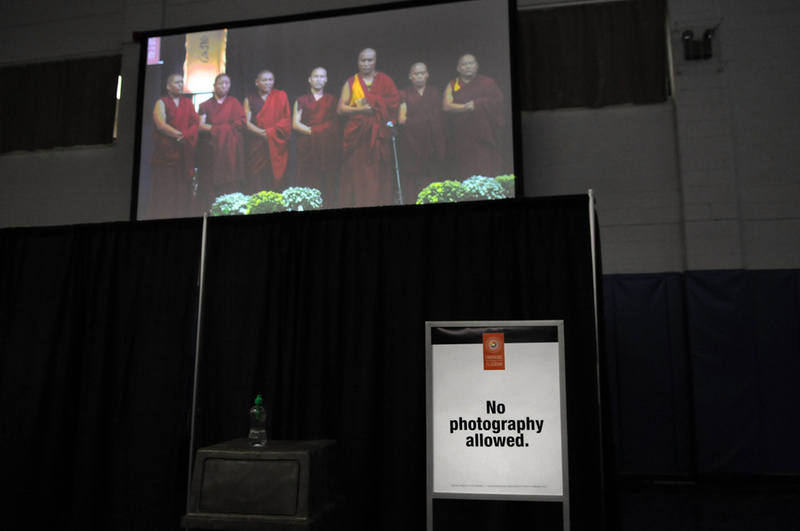 With limited shooting opportunities, I took comfort in at least being able to hear the talk, but the acoustics in our corner of the room were such that the Dalai Lama was difficult to hear. 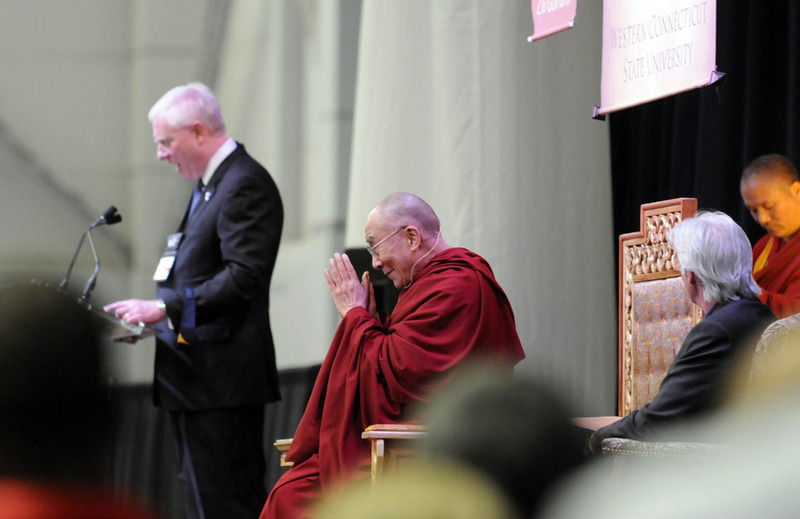 After his talk, His Holiness took pre-recorded questions from WCSU students for a few minutes before exiting through the blue curtain. But difficulties and restrictions aside, It was an amazing experience to have even a brief close encounter with such a revered and awe-inspiring man. Posted in Cloe Poisson, News & Events. RSS 2.0 feed. Thank you so much for this article and these wonderful pictures. 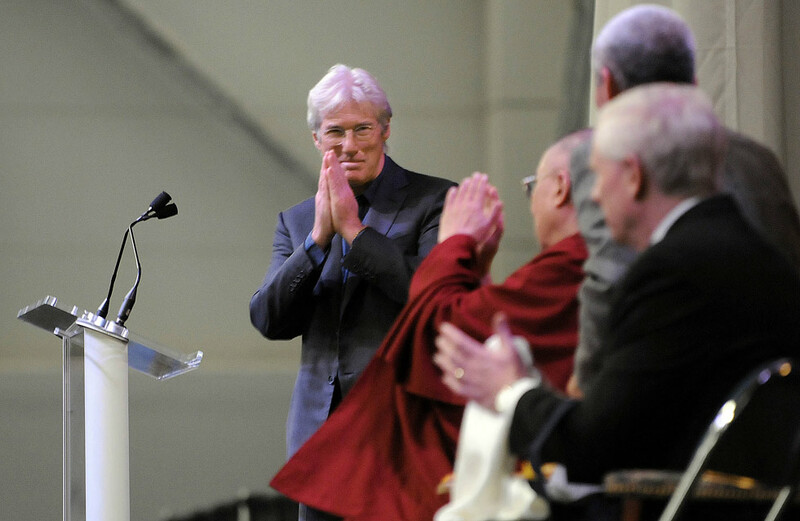 I don’t even have words for how special the Dalai Lama is. All that compassion in one body, in one heart, in one mind. How blessed the students and other audience members are to have heard and seen this great man.